WHOEVER is appointed Chelsea manager in the summer, will hold some major cards. Firstly, he won’t be Rafa Benítez. That is a huge advantage in a host of ways. In all likelihood, he will not have a fracturous history with the Chelsea fanbase, will not have been unemployed for 22 of the 24 months before his appointment, or have been sacked from his previous two jobs. 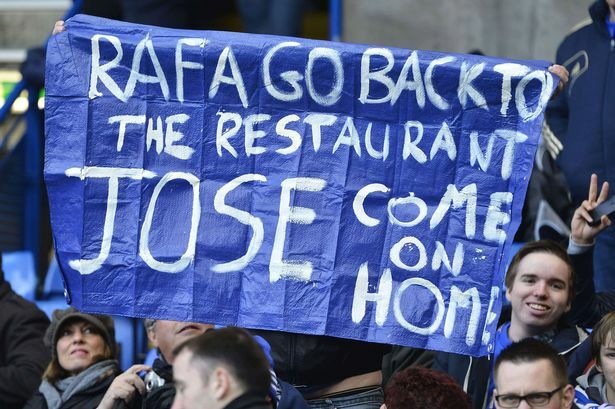 The Chelsea support have been unwavering on their feelings on a Benítez appointment at Chelsea since as far back as André Villas-Boas’ sacking. No Chelsea supporter wants to boo or jeer the side’s manager, and the feeling of relief a new manager with some semblance of personality would bring, would likely get the fanbase onside immediately. The next Chelsea manager will have plenty of talent at his disposal. Let’s take a look. When we published our Chelsea Season Preview back in August, it was a fair prediction that Chelsea could finish as high as 3’rd this season, but not challenge for the title. Seeing the club now in a real battle to make the top four, it’s clear that improvements need to be made for the club to challenge for the title next season. These improvements need to be in the management department, in the technical staff, and in terms of squad depth and starting XI players in a couple of areas. The next Chelsea manager will have already most of the tools in the squad to have an extremely successful future. Not only is there a strong core of young, hungry players, but many of last summer’s new signings will be entering their second season in the Premier League, with the acclimisation period already safely negotiated. Eden Hazard, Oscar, Victor Moses, César Azpilicueta and Marko Marin all arrived last summer, while Demba Ba arrived in January. Many of those players have played a variety of positions as the season has gone on. Oscar has played as the number 10 under Roberto Di Matteo, mostly as wide player (somewhat bafflingly) under Benítez, and occasionally as one of the two deeper central midfield players under both managers. Hazard has excelled across all three positions in the third band, and after a slight dip in form after his explosive start, he has generally maintained an exceptionally high standard of play. He has improved his defensive abilities as his experience of those requirements has increased. Those two players could be ready to truly explode in their second seasons in the same way as Juan Mata has done this season. Any new manager will get the support of the fanbase simply by not being Benítez. Moses and Ba both have significant Premier League experience and having now had time to settle in to life at a big club, should continue to be important squad players, especially in domestic competitions. Azpilicueta had a long wait to get regular involvement with the first team, but has had an excellent first season, improving his aerial abilities and variety in the attacking third as time has gone on, and looks set to be the first choice right back for many years to come. Marko Marin is a tougher one, as he has had very few opportunities in a Chelsea shirt, but has also not done anywhere near enough in those appearances to justify more game time. A departure appears likely. This means that at least one more wide player will be required in the squad. Looking at the players out on loan, it can be argued that three are of immediate use and are required in the squad. Michael Essien is clearly not the player he once was, but he would provide more reliable backup as a pure defensive midfielder than Oriol Romeu, who has had only a couple of good performances since his initial impressive form at the back end of 2011. Romeu will also be returning from a long injury layoff and may be best served going out on loan and playing regularly for the first time in his career. Romelu Lukaku has had a superb season on loan at West Brom, initially having a major role as an impact substitute, and lately scoring regularly from the start. He has had a full season to develop at Premier League level, whilst also being in a far healthier environment, sheltered from the upheaval and baffling team selections at Chelsea. At the very least, he could initially offer a significant threat as a substitute and boost the currently poor striking options at the club. Kevin de Bruyne has had a very impressive season at Werder Bremen, playing mostly at an attacking midfielder, but also occasionally in other roles, on the left flank and even as a false nine. For Belgium, he also plays a number of different roles and is now a first choice starter for his country. He would perfectly suit the role that Marin and Yossi Benayoun have played in the second half of the season as the rotation option on the flank, whilst also playing games in a central position, should (or when) Frank Lampard leaves. On paper, the first XI is very strong, but there is not enough quality in reserve. Even with just those three returning loanees, the squad is far stronger than it is at present. Should a new manager also use a system that suits the players better, then the results, performances and consistency should improve, and any new manager would look to be working miracles, even before any new signings. Once you take the wages of Florent Malouda, Paulo Ferreira and Yossi Benayoun off the wage bill (their contracts all expire this summer), it frees up some funds for new signings’ wages, whilst Lampard’s likely departure (regardless of whether that proves a grave error or the correct decision), will also lower the wage bill significantly. 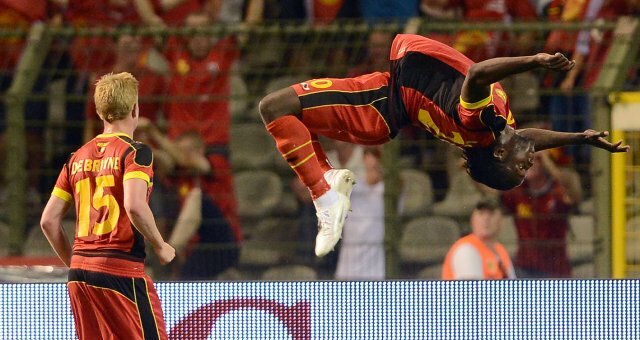 Kevin de Bruyne and Romelu Lukaku: returning loanees to bulk up weak areas in the squad. Looking at that squad, it’s clear that 4231 is a shape that perhaps only suits a handful of players. Juan Mata and Oscar can be considered genuine number 10’s, but both are more than capable of playing other roles with no drop-off in production as a result. Mata played most of last season on the left of a 433, with plenty of license to roam. This season, many of Mata’s best performances came when he was playing on the right of the 4231, and many of his best moments in games come from an “inside right” position, even when he has started the game as the number 10. Oscar’s passing ability and movement have been utilised best with Brazil, where he barely goes 30 seconds without having a touch of the ball. He looks to follow the play, constantly giving team mates an option, and then also looking to press when the ball is lost. His defensive work is often ball-focused, instead of focused on space or an opponent, something that is also true of Ramires. Having those two looking to press opposition midfielders in a 433, with the security of John Obi Mikel, occupying a space instead of looking to engage opponents, may be the best way to utilise those players. Any role which limits Ramires is wasting his athletic talents, and his passing is too haphazard to be used as part of a double pivot. His biggest strength is on transitions, either bursting past opponents after winning the ball himself, making up ground to support counter attacks, or using his athleticism to cover out-of-position team mates when Chelsea lose the ball. He scored 12 times last season, and had he not spent the most part of his season in a defensive role, he could have scored close to 20 in my opinion. These goals from midfield will be crucial as Lampard’s goalscoring contribution needs to be replaced. If there is truth in the recent reports that José Mourinho could return to Chelsea, it is worth looking at the squad composition he tends to favour. In his roles at Porto, Chelsea and Internazionale, Mourinho has liked to have an experienced core of players. He may very well hold the key to any new contract for one of his closest former players in Frank Lampard, and his appointment would probably also mean good news for Michael Essien, who has featured fairly often for Real Madrid this season. In defence, Mourinho has often used a central defender at fullback in order to allow a more aerially secure defensive unit. Currently, Branislav Ivanović fills that role and the option of using him at fullback is likely to appeal to Mourinho in tough Premier League away games. He also often switches to a back three when chasing games, so pacey central defenders who are comfortable in the channels would be needed. Gary Cahill and David Luiz tick that box. Another common alteration is to move an aggressive midfielder to fullback when chasing games. This was seen regularly at Chelsea with Essien or Lassana Diarra at right back, and whilst Essien has featured a fair amount at right back this season, this is a role that Ramires seems perfect for. In central midfield, The Special One has usually liked a large pool of versatile, tactically intelligent midfielders like Dmitri Alenichev (Porto), Jiří Jarošík & Aleksey Smertin (Chelsea), McDonald Mariga & Sulley Muntari (Internazionale) and Esteban Granero (Real Madrid). All in likelihood at least one starting XI-quality central midfielder is required, as well as one experienced, possibly tall central midfielder to plug holes and help to see out games as a substitute. Mourinho has also shown a preference having at least one target man in his squad to allow a more direct alternative, and usually likes a mix of pacey wingers and creative wide players as options either side of a lone striker. Moses, Hazard and Mata fit the bill perfectly in this department, whilst Ba and Lukaku would provide target man options. A world-class, starting striker would probably he purchased. With Mourinho’s preference for mentally strong players, it’s hard to see a future for Fernando Torres. Should a less-renowned manager be appointed, Torres may get yet another chance as part of the squad, but entering a season with only two strikers will surely not be repeated either way. Even if the next Chelsea manager is not Mourinho, the new man will enjoy far more fan support than Benítez, will have many of the best talents more acclimitised to English football, and will have at least three returning loanees who can bulk up a small squad. Some tactical tweaks, one top signing in attack and central midfield, and perhaps the purchase of a reliable number two goalkeeper, and Chelsea should be ready to launch a genuine title challenge next season. Well organized, thought out article. Leans strong to “if Mourinho returns” but also covers other options. I feel Lukaku will feature strongly in a Mourinho led side, as his strength, balance and pace mimic Drogba, who’s game stepped up several notches under the Special One. Article doesn’t mention Terry or Lampard much, who are mentally strong (and developed that trait under Mourhino). I’m curious to see if the new manager alters from a 4-2-3-1 given the type and style of player Chelsea currently retain. If Mourinho returns I will put my house on him winning the title. Best signing of the season. Whilst world class players makes a difference to any team there is no one that is as influential as Mourinho. He almost guarantees trophies. Hope he doesn’t go to Chelsea. i think that having mata in front of ramires would compensate for his lack of passing ability – i know mata is great in the middle but we have such a quality squad it does not make sense to build the team around one player. David Luiz I know can play in DM but i think that without another holding player next to him he might struggle a bit. If he does run forward he can let mikel and ramires drop back and box it in. Plus i like having a centre back who can score outrageous goals. Hope he gets the captaincy in the future.